The Sustainable Bottom Line project helps local businesses to boost the green transition and improve their competitiveness. 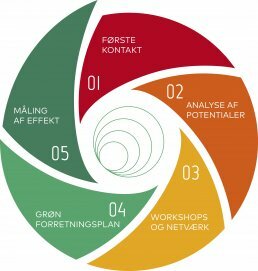 The Sustainable Bottom Line project (Bæredygtig Bundlinje) gives small and medium-sized enterprises in the Capital Region the chance to develop a green business model which enhances energy and resource efficiency, competitiveness and boosts the bottom line. Throughout the project, companies are offered a structured process with potential analysis, consultancy and process support, culminating in a green business model. This gives smaller companies, who do not have the capacity to develop green business models on their own, the opportunity to work systematically with sustainable business development. Sustainable Bottom Line builds on the Carbon20 project, where 119 SMEs realized a 22% carbon emissions reduction on average. Sustainable Bottom Line is a collaboration between the municipality and each company, creating value for both parties. While the companies experience the direct benefits of the project, their reduced CO2 emissions and resource consumption also provide a positive effect on the municipalities climate and waste targets and green business development. In the first half of 2018, 88 companies were part of the project, and the goal is to develop a total of 100 green business models by 2019. This is equivalent to a reduction of companies’ material consumption by approximately 2,500 tonnes and a cut in CO2 emissions by approx. 5,000 tonnes. Sustainable Bottom Line contributes to energy efficiency in companies and supports the transition to renewable energy through energy assessments and guidance on better utilization of raw materials. The project helps to map possibilities for recycling materials, such as upcycling, so that resources can be reintegrated into the economic cycle. Core to the project is the vested cooperation between companies and the municipalities, as well as their joint work to underline resource efficiency in business strategies. The project is a collaboration between Allerød, Copenhagen, Fredensborg and Frederikssund municipalities.